After enjoying a leisurely morning to myself, I decided to get dressed and go to the post office to mail a few packages that had been sitting on my desk all week long. I wanted them off my mental to-do list so I could feel more spacious and relaxed. I’ve been busier than usual lately and craving space. For the last two weeks my days have been filled with back-to-back meetings, too many appointments, and phone calls crammed in between both. I’ve been rushing, feeling progressively grumpier and frustrated with my schedule. As if someone else were filling it up . While getting dressed, I glanced at the clock and noticed it was 11:40 am. Twenty minutes before the post office closed. So I started rushing to get ready, calculating in my mind how quickly I could get there. I immediately stubbed my toe. Then I poked myself in the eye while putting in my contacts. And I knocked over an orchid plant in the corner of the room. As I ran into the bathroom to rake a brush through my hair, I felt my adrenaline rising. But I continued rushing anyway to try and make it to the post office on time. Until I caught a glimpse of myself in the mirror. What are you doing, Cheryl, I said to myself as I looked deeply into my eyes. Who the hell’s going to die if you don’t mail those packages? 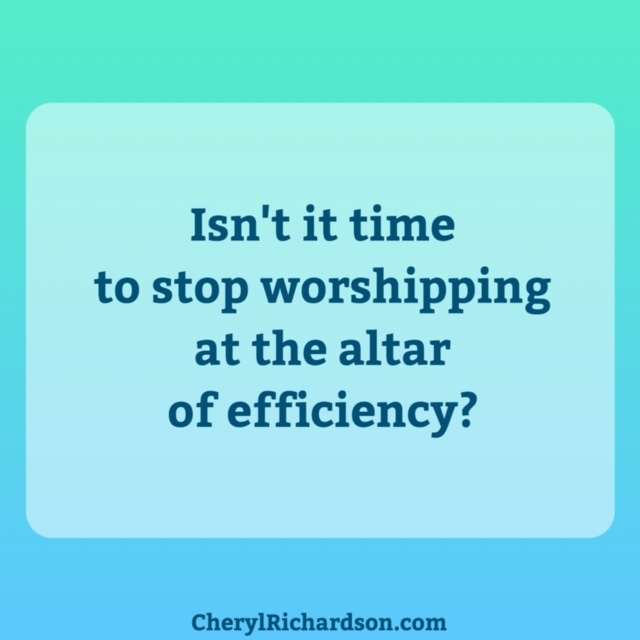 For most of my adult life I’ve worshipped at the altar of efficiency. As much as my self-care has improved over the years, the habit of rushing still gets me in trouble. I like to get things done. I usually wake up raring to go and it’s easy for me to get pulled into a vortex of action-hero energy. Suddenly I’m doing fifteen things at once like a mental marathon runner trying to beat her last, best time. Handling everything, present for nothing. So on this morning, I put the hairbrush down and had a little chat with myself. Sweetheart, I said in a kind and loving voice, the days of idolizing efficiency are over, remember? There’s no reason to rush anymore. Let’s choose peace of mind over those packages, okay? There are some habits and behaviors that we’ll take to the grave. But they don’t have to run our lives. I walked out of the bathroom and sat down on the bed. Thank God for self-awareness. I no longer measure my success with self-care by whether or not I’ve eliminated bad habits. That’s a setup for failure as far as I’m concerned. Instead, I celebrate the fact that the time it takes for me to see that I’m in trouble and intervene on my behalf, gets shorter with age. This week I plan to keep the habit of rushing on my radar screen with the intention of slowing myself down. More white space in my calendar. Today’s lesson is simple: Love yourself, bad habits and all. Just be sure to look in the mirror now and then . I love everything about this video. You can watch it here. Thanks, Andree .